It's a double whammy -- that changing practices (where readers access news and what type of news) have been augmented severely by the recession. But the recession will end. Companies will advertise again. Ads will be bought. What the landscape looks like in two years is another matter. I think what's ultimately needed to have healthy and profitable media publishing is an interactive newspaper, something that can be updated wirelessly, plays video, flash, audio and when the train arrives can be folded up and tucked into your pocket. I am sorry that advertising dropped off. Really, but that is NOT out of line with the economy. I am hopeful that a recovery is in progressm but the sky is not falling. The fourth Reich is not taking over, we are just in a big recession/downturn or whatever. It's not fun for anyone, and especially, frankly, everyone. But many people in Santa Barbara, at least are just hoping for the best. @Michael Snider - That interactive newspaper sounds a lot like a combination of an iPhone and a Kindle...could see it going that way (especially a Kindle, since you don't need to start a data plan like you need for the iPhone). Though I'd recommend folding those, kind of pricey to be folding them in half...;). In all seriousness, maybe newspapers really do need to be finding ways either to develop that kind of technology or piggyback on existing platforms like a Kindle or iPhone. I know some papers are already publishing Kindle-friendly papers, which is a good start, but I think it will be a while before Kindles become common enough to really make a difference. On top of that, I believe you need to pay a subscription fee to view the paper on your Kindle, which seems like a step in the wrong direction. If charging for online content doesn't work, why would it work for a Kindle? But it won't return to conventional printed city dailies. Free local papers, maybe. But the future is on the net. Currently, Internet advertising is way undervalued compared to print advertising. This will change, as ad buyers work out where the eyeballs are. 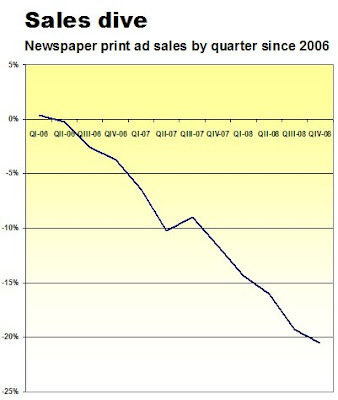 But there will be a net loss to newspapers, even on the web. There are too many competitors, plus the product of newspaper journalists is unreliable and low in quality. I always hear this talk of live feeds from school boards, city meetings, etc. That sounds great, but most business is never done during the public portions of such meetings (or, sometimes, at meetings at all), and in a surprisingly large number of places, no one cares to go unless the issue directly affects them (zoning, for instance). There have always been spikes of outrage and rarely consistent high turnout. More often than not, the people incessantly recording these meetings (generally legally) are, to put it kindly, eccentric and/or have a personal score to settle. Is that pessimistic? Yes. But it's no more over-the-top than the opposite notion that the American public is going to start rabidly and proactively caring about things like meetings, even on a hyperlocal level. How does this hurt newspapers (and related ventures)? The demand they think is there for this hyperlocal news probably isn't in many places. And it won't pay in most spots, if not all. Neither is the current business model working, of course. So, it's a puzzle. I am curious if dropping some days of home delivery a week will catch on. It certainly would help a newspaper properly distribute resources between print and online. I wouldn't be surprised if the wave of web width reductions slows and is replaced by dropping delivery days. That would provide an immediate newsprint savings without the millions of dollars in costs to retool the presses. "I am curious if dropping some days of home delivery a week will catch on." Undoubtedly it will grow. Only problem: if a daily paper has yesterday's news today, why would I buy a non-daily for news? Dropping delivery days is part of the rush to irrelevance newspapers are currently pursuing. In the winning there is only losing. As for the couple of people who have linked this advertising decline to the economy, Mr. Mutter's little chart ends with the quarter in which the US economy collapsed. The long slide he shows began in Q2 of '06 and simply accelerated as the economy tanked. This is not a cyclical decline or some advertising hiccup that will be cured if newspaper folks simply hold their breath long enough. This is the end of the economic system on which newspapers were built; the end of the world (for us that work at newspapers) as we have always known it. Breath in, breath out; get ready for that next drop.